Do you often to insert block with non-uniform scale? Sometimes I do. 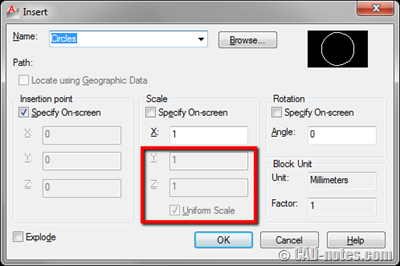 Have you ever found that when you insert your block, you can’t disable uniform scale option? If you dig further, you will find that it’s a block specific. The same thing will happen if you try to insert the block on other computer. You will find other blocks you have don’t have this problem. 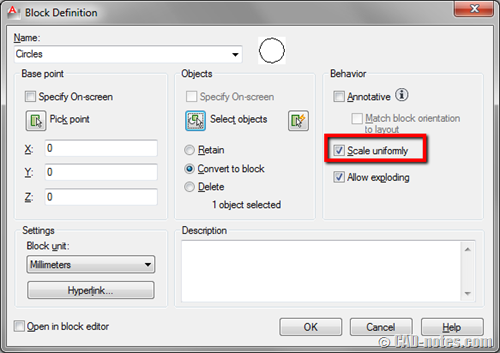 This option is disabled because when you created the block, you activate scale uniformly in block definition dialog. So what if you already created and placed several blocks? Do you have to explode and recreate the block? No. You can open the block in block editor then open properties palette. Find scale uniformly parameter, and change it to no. Is there a variable that can be manipulated from the command line to set an entire drawing to scale uniformly? I can do it in the block editor using the current drawing and then changing it in properties, but I am looking for a faster way.